The Private Security Industry Act (PSIA) 2001 set the ground rules for the licensing of security officers operating within the manned guarding industry and commencing in March 2006 the self-regulated industry was replaced by the Security Industry Authority (SIA) who became responsible for regulating the private security industry throughout the United Kingdom. The compulsory licensing of individuals undertaking designated duties within the private security industry to ensure that they are ‘fit and proper’ persons, who have received formal training and are qualified to carry out their duties. Management of the voluntary Approved Contractor Scheme (ACS) which measures security companies against independently assessed criteria. The ACS introduced a minimum level of achievement in respect of operational and performance standards for companies providing security services. Only organisations that meet these standards, and continue to do so when inspected annually, are awarded Approved Contractor status, and may advertise themselves as such. For further information on the SIA and ACS go to The SIA’s official site. The scoring pyramid below, which is available on the ACS section of the SIA website, shows the total number of companies in each quartile and the score which they have had to achieve during their annual assessment to reach that position. SIA ACS approval is not only a source of confidence for buyers of security services as they seek to select a trusted provider, it also provides an excellent framework for setting, improving and monitoring your own standards. SIA ACS approval is voluntary and instantly positions your company as having been independently assessed and meeting a recognised level of performance. The Approved Contractor Scheme (ACS) has been designed by the Security Industry Authority (SIA) in consultation with representatives from across the industry; its main objective is to assist and raise performance standards in the Guarding Services sector. NSI was one of the first organisations to become an assessing body for the SIA when the ACS started over ten years ago. Today we work with elite companies operating within the Guarding Services sector who wish to differentiate themselves as being amongst the best providers of private security services in the United Kingdom. Inclusion in the Register of Approved Contractors published on the SIA website. Authority to use the ACS Accreditation Mark on stationery, livery and websites. Approval may provide access to tender processes where ACS is a pre-requisite. For over 5 years CCS has facilitated industry specific certification, raising standards in the interest of the customer and was one of the first organisations to be appointed by the SIA as an ACS Assessing Body. The CCS advisory team are industry specialists whose knowledge and experience is second to none in the industry. Whatever the size of your organisation, the short answer is ‘No’. We are often asked this question by companies who are considering applying for the ACS Scheme. We can provide all the information you need to become ACS approved without the use of a consultant. Simple day-to-day projects that you can do at home. Involve your family with maker activities. • The compulsory licensing of individuals undertaking designated duties within the private security industry to ensure that they are ‘fit and proper’ persons, who have received formal training and are qualified to carry out their duties. • Management of the voluntary Approved Contractor Scheme (ACS) which measures security companies against independently assessed criteria. If your company has an ACS score of +128, why miss out on the commercial advantages of The ACS Pacesetters membership? To achieve SIA ACS accreditation companies must reach a score of zero and currently the maximum score is +175 points. All members of ACS Pacesetters will have gained a minimum score of +136 during their recent annual inspection by one of the SIA appointed UKAS inspection bodies. There are currently in excess of 830 Contract Security Guarding Companies who have achieved ACS accreditation therefore, it is very difficult for the buyers of security services to differentiate between them. The ACS Pacesetters places emphasis on the importance of the annual score, making the tender process for end-users very much simpler. 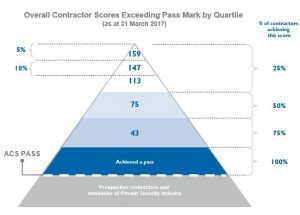 In restricting membership of the ACS Pacesetter to the top 15% of SIA approved security companies, approximately 125 companies are eligible to join. These companies, both national and regional, have proved they are market leaders in the security guarding industry and are therefore capable of providing an excellent standard of service to their clients and a high degree of care for their employees. As a client, it makes sense to include companies in the top 15% of the ACS scoring system when compiling your tender list. Why choose the SIA Approved Contractor’s Scheme? We have a 100% success rate in achieving the ACS status on behalf of our customers. “Approved contractors are demonstrably committed to customer service and the compulsory licensing of their staff. This means their customers can rest assured that every private security operative deployed on their premises will be working within the law”. The Approved Contractors’ scheme will demonstrate to your customers and suppliers that your business is running professionally. It proves that you continually strive to improve business processes and that you monitor and control service standards. Many security companies are not securing contracts with Councils, Local Government, large corporate and construction companies due to a lack of accreditation. This has resulted with smaller unsecured contracts and does not allow them to plan ahead. You don’t want to be excluded for quoting for large contracts and business opportunities because your company does not have this important accreditation. Your customers can easily distinguish between properly run companies by selecting an Approved Contractor. Your customers will use this accreditation to define who they should use for their security requirements. Being an approved contractor will give your customers peace of mind that you are a professionally run business who looks after its customers and staff. Achieving the Approved Contractor’s scheme will enable you to secure longer term contracts and plan your long term business. In addition, by being accredited you are allowed to deploy 15% of your staff while their licences are in progress. Produce draft ACS system, tailored to your business and branded with logos and information. Undertake Pre-assessment of the system to ensure all elements are covered and all are prepared for assessment.